Bathroom Vanity Units make an excellent addition to any Bathroom. Making a stylish feature out of your basin, they also add vital space without sacrificing valuable floor space. At Designer Bathroom Store, these units are some of our best sellers, and are often purchased alone as part of a bathroom upgrade, or as part of a completely new bathroom suite. These vanity units come in all shapes and sizes, so look great in the largest or smallest of bathrooms. They are an excellent choice for en-suites and ‘second’ bathrooms where the relatively small space means storage can be a struggle. 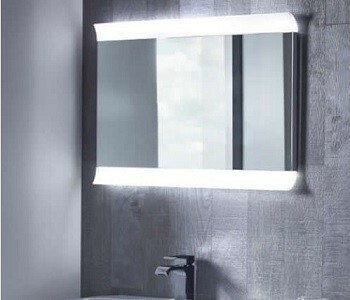 Furthermore, we also sell Cloakroom Vanity Units, Wall Hung Vanity Units, and Floor Standing Vanity Units. If you have any questions about this range, please do just get in touch and we will be more than happy to help with any questions you may have. 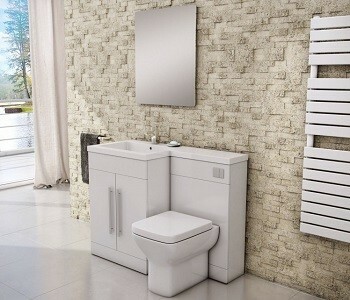 Back to Wall Toilet Units are one of our favourite products here at Designer Bathroom Store. In our opinion, they finish a bathroom off perfectly. A massive range of designs, sizes and finishes are available – many of which coordinate with other bathroom furniture including vanity units. By far the biggest advantage of using these units is the fact that they keep the toilet cistern and plumbing completely out of sight – helping create a sleek, contemporary look. Typically, these units have an uncomplicated style with push button operated flush. There are however variations in the range, with the Kartell Jubilee being the perfect example. 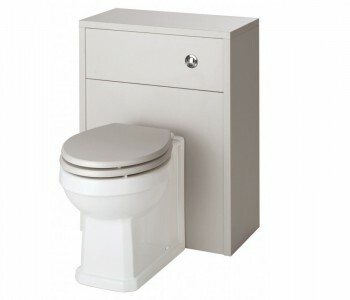 This unit has a concealed cistern, cupboard storage as well as an inbuilt basin. It’s finished in gloss white and looks just right whilst serving multiple purposes. If you have any questions about back to wall toilet units, or which unit is right for your bathroom – then please do get in touch and we will be more than happy to help. It’s always amazing how much ‘stuff’ ends up in a bathroom. There’s everything from bottle of shampoo and shower gel, shampoo, bath bombs, last year’s sun tan lotion, razors, toothbrushes, toothpaste, all of which needs storing! The situation gets worse when there’s some sort of sale on toothpaste, with the questions ‘where to put these ten tubes of toothpaste’ being asked more often than it should be. 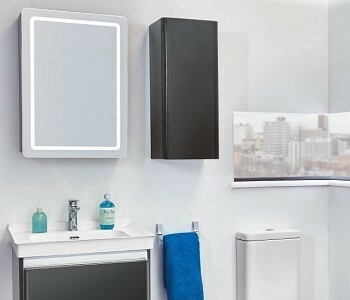 Luckily, at the Designer Bathroom Store we offer a massive range of contemporary and traditional bathroom cabinets, which as well as being designed to look fantastic – has been designed to swallow up all of your bathroom bits and pieces, allowing you to enjoy a clutter free, relaxing bathroom space. The designs within the ranges vary massively, with traditional pieces such as the Roper Rhodes Hampton, right across to luxury designer pieces such as the Roper Rhodes Pursuit Charcoal Mirrored Storage Unit. These designs cater for all sizes of bathroom, as well as styles and types of cabinet include: Wall hung Cabinets, Mirror Cabinets as well as Floor Standing Units. All of this furniture has been handpicked by our expert teams, and boasts an excellent design as well as reliability. Furthermore, we have negotiated exclusive prices with cabinet manufacturers on your behalf. If you have any questions about this range of Bathroom Storage, or can’t quite decide on which cabinet is best for your bathroom – please do just get in touch and we will be more than happy to help. At Designer Bathroom Store we speak to a lot of customers who are working with small bathroom spaces, looking for space saving solutions – which don’t sacrifice the luxury and functionality of a larger bathroom. 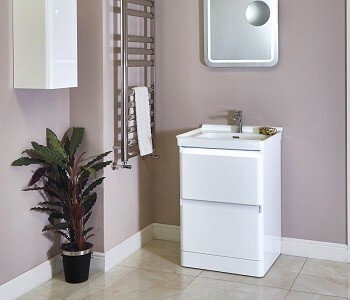 To that end, we have source an excellent range of combination units which feature a WC, Storage Space, as well as a basin. These excellent products have become incredibly popular with small bathrooms, as well as in en-suites and even cloakrooms. This range has been handpicked from our trusted suppliers, with Phoenix and Scudo contributing most of the range. Gloss white is one of our most popular finishes, but there’s grey, white and avola to choose from. As always, if you have any questions about this product range – please do just get in touch and we will be happy to help. We use our bathroom for storage more than you think, making it a room which can very quickly become cluttered and chaotic. To keep everything in order, and to add another element of style into your bathroom, we source and supply a range of bathroom furniture from the world’s leading bathroom designers. All of which has been chosen on grounds of excellent value for money, quality, and design. The range encompasses everything from Vanity Units, Storage Cabinets, Toilet Units as well as a range of Mirrors – which have been designed to suit both contemporary and traditional bathrooms. There’s a range of finishes available, allowing you to return your bathroom back to perfect, tidy and most importantly relaxing…working order. A lot of customers purchase this furniture independently, retrofitting it to their bathroom – whilst others choose to purchase it as a complete suite. This furniture makes a huge difference either way, so the choice is yours!